Many of us spend all winter longing for those hot, sunny summer days. Driving down the highway with a breeze rolling in from the windows or a sun roof can be a dream. 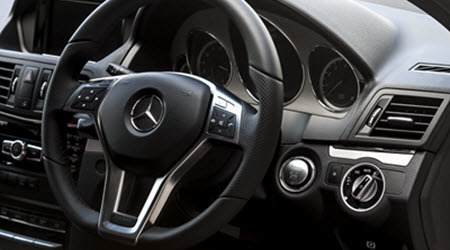 However, if you have ever experienced your Mercedes air conditioning not blowing out cold air as it should, you are aware of just how frustrating a problem it can be. Not have an air conditioning system that works properly on your daily commute in the city can make ten minutes feel like an hour! While most of us are able to recognize when our air conditioning isn’t working properly, we may not all know some of the most common reasons why it isn’t working or how to diagnose them. There are many components involved in the correct operation of a climate controlled air conditioning system, but one of the most common problems that can occur is a leak in the manifold hose. The air conditioning system uses a refrigerant gas called freon. This gas, freon, needs to be under extremely high pressure in order to function properly. The gas is then circulated by the compressor. The compressor relies heavily on the manifold hoses that are attached to it to circulate the gas correctly and efficiently. These hoses can sometimes fail by simply developing a small leak that, over time, will cause the refrigerant levels to become low. These leaks are often very small, and it will usually take several days for the levels to become low enough to cause a problem or noticeable leak. It can seem like an issue with your air conditioning arose out of nowhere, and that can happen, but more often than not, the issue takes a long period of time to occur. Since we don’t check under the hood of our car daily, we just aren’t aware that it’s happening. In most climates, we can go for extended periods of time without even using our air conditioning. It’s not until the weather warms up enough and we are trying to use our air conditioning when we get nothing but warm air blowing in our face do we take notice of the failing system. Unfortunately, any issues that may arise with our air conditioning system will not trigger any type of warning, such as our check engine light. However, there are many ways to diagnose a leaky air conditioning system. The first thing you should do if you suspect a leak is to visually inspect all the lines for physical damage. Normal wear and tear, as well as age, can sometimes cause the lines to fail. The easiest way to do this is by using a special dye inside the system. The dye will allow you to see exactly where the leak is located. A qualified technician can put a colored dye inside your air conditioning system, and it will appear where the leak is located. Then, you will use a tool called a sniffer that will detect precisely where a leak is located by carefully running the tool over the entire system. This often works best with smaller leaks, as larger leaks will often times flood the entire engine bay with freon. If that happens, it can make it somewhat difficult to pinpoint exactly where the leak may be. Making sure that freon is handled by a professional is a very important part of air conditioning repair. This refrigerant material may not be harmful in small and isolated amounts but can be if extended exposure occurs. Freon is also extremely harmful to the Earth’s ozone layer. With both of those things in mind, a professional with the right tools is not only good for you and your vehicle, but it’s also better for the environment. If you are living in or around Dallas, University Park, Highland Park, Irving, and Coppell, TX the professionals you can trust can be contacted at Louden Motor Car Services, Inc. It is best to trust the experts when it comes to an air conditioning leak to protect the future health of your vehicle and the environment you enjoy every day. * Mercedes Benz E200 AC Vent image credit goes to: joephotographer.